Could game consoles officially come to China? Video game consoles (besides Nintendo's DS) have been banned in China since 2000, but that could be about to change, according to a report from China Daily. The Chinese news site reported on Monday that China's government ministries conducted surveys and held discussions about the possibility of ending the sale and import ban on game consoles, according to an unnamed source in the Ministry of Culture. The source reportedly said that it won't be easy to do so, though, "since the ban was issued by seven ministries more than a decade ago." "All parties" will need to approve of lifting the game console ban, the source reportedly said. China Daily claimed that the video game console ban was originally enacted "because of fears of the potential harm to the physical and mental development of the young." That definitely sounds like some doublespeak nonsense though, especially considering that online PC gaming, often regarded as highly addictive, is legal and commonplace in the country. What seems more likely is that the ban was enacted due to souring relations with Japan, the origin of many video games and game consoles. Either way, China's decade-old ban on video game consoles appears to have been as effective as America's war on drugs, which is to say not very much at all. According to reports on China Daily, video game consoles are widely available in China, despite being illegal to import or sell. Of course, piracy is rampant in the current black market atmosphere, so console makers like Microsoft, Sony and Nintendo don't see a lot of revenue from these sales. That may be part of why the three companies have been trying to get the official ban lifted for years. Sony Computer Entertainment established a branch in China last June that's reportedly for training and R&D purposes, and Microsoft launched the controller-free Xbox 360 and Windows peripheral Kinect in China in October, though Microsoft's Asia-Pacific Research and Development Group chairman Zhang Yaquin reported that it's not used for gaming there. And according to a November Tech in Asia report, Sony's PlayStation 3 had received an important certification from the Chinese government, further indication that the game console ban might be ending. 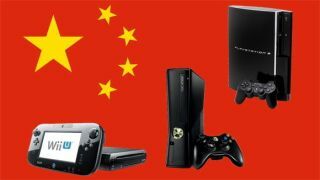 TechRadar inquired with representatives for Xbox, PlayStation and Nintendo to find out if they have any plans to begin expanding into China or if they have been involved in any recent discussions. A Microsoft spokesperson responded, "We are always evaluating how and where to expand Xbox availability to other parts of the world, but have no additional comment at this time." The other companies have yet to reply.